The corrugated water tank is an enduring image of the Australian landscape. Aquamate realised a long time ago that using galvanised steel for its corrugated tanks was the ideal solution for durability and longevity. Using galvanised steel walls and a specially manufactured polyolefin liner enables Aquamate to offer a 20-year “No Service Costs” warranty on its water tank range. All of our steel rainwater water tanks are delivered to site as a flat pack and are in most cases assembled within a day. From 24,000 to 276,000 litres, all of Aquamate’s steel rainwater water tanks are available in a plain galvanised finish or a large range of colours to match existing sheds and fences. Since 1986 Aquamate has been driven to deliver service and product excellence in the rainwater harvesting sector. Over 30 years of experience, and continually improving our product, such as our rain saver gutter system, we have positioned ourselves as leaders in the rain harvesting industry, and believe we offer the very best rainwater harvesting tank money can buy. Rainwater harvesting has become a part of Australian culture. Rainwater has a multitude of uses around your property. From garden irrigation to replacing mains water for your entire house, rainwater that you might normally lose as run-off can be efficiently collected and re-purposed no matter what your requirements. With Aquamate’s Rainsaver gutter system you can capture rainfall from the roof of your tank along with your house or shed. With rainfall intermittent throughout most of Australia, it makes sense to collect as much water as possible when it does rain – water you’d normally be paying for. Aquamate’s steel rainwater tanks can be fitted with our proprietary Rainsaver gutter system that collects water from the roof of your tank and redirects it into the tank for later use. The extra rainwater from the roof of your tank, in addition to the area of your home or shed, can make a significant increase to the total rainwater collected. The water stored in your steel rainwater tank has many uses including; farm and garden irrigation, household water use and static water storage for bushfire protection. Aquamate steel rainwater tanks can be integrated with other pump, pipeline and plumbing systems, from bathroom and laundries to taps and drinking water, from lawn sprinklers to pivot irrigators. Aquamates flat pack water tank offers you the ultimate rainwater harvesting solution. Rainwater harvesting is essential, and once set up, easy to manage. Aquamate only uses the best materials to manufacture steel rainwater tanks. 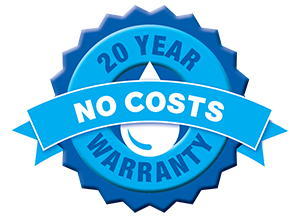 High-quality materials mean we can be sure that the corrugated tank will last a long time – sure enough to offer a 20 year “No Service Costs” warranty when used for rainwater collection. With more than 30 years of research and development, an Aquamate tank is the first choice for durable, reliable and affordable large volume water storage. Aquamate have been building and repairing steel rainwater tanks since the 1980’s – 30 years of experience, plus dedicated design and manufacturing capability, mean that we know what’s best when it comes to producing top quality tanks. Our tank liners are AS4020 certified – suitable for contact with drinking water, which means you can rest assured that they are safe for you and your family. All of the liners that Aquamate uses are Bisphenol A (BpA) free. Aquamate only supply galvanised coated steel water tank shells. Constant contact with the condensation that builds up between the tank shell and liner means that Zincalume® tanks are just not up to the job – corroding much faster, even when used with sacrificial anodes. Head over to our frequently asked questions to read more on why galvanised steel should be your only choice for lined water tanks. Aquamate’s tanks are supplied with a Zincalume® roofs because the zinc-alloy coating works perfectly on the roof – just like a house. Alternately, you can choose to have your corrugated tank with a galvanised steel roof if you prefer the traditional look. Aquamate tanks look great in a plain galvanised finish, or they can be supplied in a wide range of colours. Coloured tanks can fit in perfectly with your existing tanks, sheds, fences, roofs and gutters. All Aquamate tanks are supplied with a 50mm outlet, inlet basket to connect your down-pipes, padlocked access hatch and removable light-duty ladder. Optional accessories are available for every steel rainwater tank to suit your specific requirements, including; level gauges, firefighting and pump connections, as well as additional outlets and overflows. Have a look at our Rural Water Tank page for more product details, or download our Water Tank Brochure. For info on our US operation, you can view our Rainwater Collection Tanks page. Want to collect more rainwater? Aquamate’s rainwater harvesting tanks can be fitted with our innovative Rainsaver gutter system, utilizing the tank’s roof to increase the catchment area for optimal collection of rainwater which is then redirected into the tank. The domed roof on an Aquamate rainwater harvesting tank has dozens of channels around the perimeter of the roof that run from one side of the cistern to the other. Rainsavers are placed at the end of each channel to collect the water during rainfall events. If the tank is full, the water diverts to the overflow as it normally would. 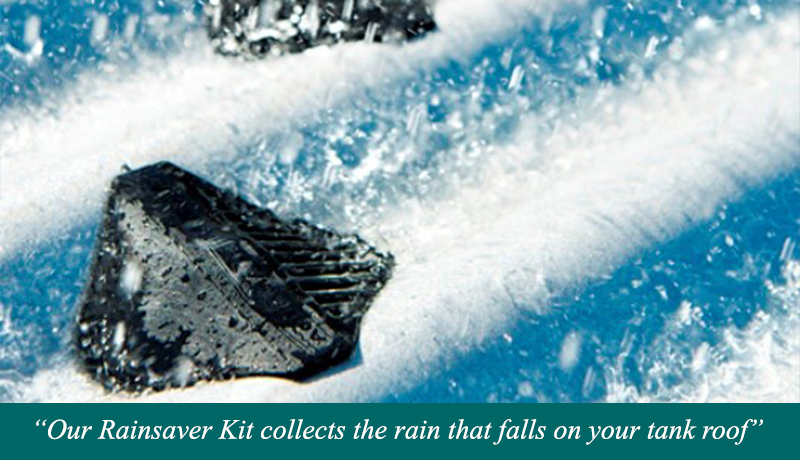 The rain saver gutter is an essential part of maximizing rain harvesting. Depending on the size of your tank the rainsaver gutter can collect over 60,000 Litres based on locations with an annual rainfall of 500mm. Rain harvesting estimates can be discussed with one of our staff, and they will help you with an estimated rainwater collection for your tank and location. Aquamate have been manufacturing rainwater storage tanks since 1986. We engineer metal rainwater tanks from 5,000 to 102,000 gallons. Our steel rainwater tanks are engineered in a state of the art facility. For our rainwater tanks, we use a galvanized tank shell, rather than a Zincalume shell, which means no sacrificial anodes. A galvanised rainwater tank from Aquamate has a 20 year “No Service Costs” Warranty. This is the ideal flat pack water tank for rainwater harvesting.